Ready.wv.gov > News > Great American Shake Out! 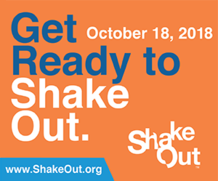 Visit ShakeOut.org to register your participation, find resources, and learn more. To learn more about earthquake safety, watch the When the Earth Shakes video and visit Ready.gov.